United Nations, Dec 18 (IANS) Afghanistan has welcomed the exemption from the Iran sanctions given by the US for the India-developed Chabahar Port project. 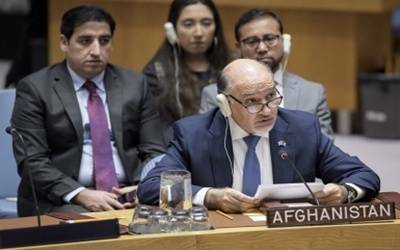 "We appreciate the collaboration and flexibility of our strategic partner, the US to work with Afghanistan, Iran and India towards exempting the port from its sanctions," Afghanistan’s Permanent Representative Mahmoud Saikal told the Security Council on Monday at its meeting on his country. Despite President Donald Trump’s animosity towards Iran, the US had to give the exemption to Chabahar to enable Indian assistance to reach Afghanistan, where Washington is mired in a 17-year-war against the Taliban, the Al Qaeda and their allies. This followed Trump pulling out of the nuclear deal signed during former President Barack Obama’s tenure between Iran and the five permanent members of the UN Security Council, Germany and the European Union, to end sanctions in return for Tehran stopping nuclear weapons development. Announcing the US exemption for the Chabahar Port, a State Department spokesperson said last month that it "relates to reconstruction assistance and economic development for Afghanistan. These activities are vital for the ongoing support of Afghanistan’s growth and humanitarian relief". Trump’s South Asia strategy "underscores our ongoing support of Afghanistan’s economic growth and development as well as our close partnership with India", the spokesperson added. Last year, Trump assigned a "critical" role for India in his country’s South Asia strategy for fighting terrorism, building up a safe Afghanistan and appealed for help from New Delhi.